BRASILIA (Reuters) - The Brazilian government will set up a collection center for humanitarian aid for Venezuela in the northern border city of Boa Vista within the next few days, the Venezuelan opposition's envoy to Brasilia said on Tuesday. 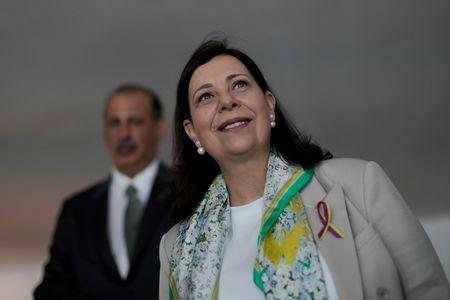 Maria Teresa Belandria, who has been recognized as Venezuela's ambassador by the Brazilian government, said she will meet with Brazil's defense minister on Wednesday to talk logistics for getting aid from the United States, Brazil and possibly Canada to Boa Vista. She called on the Venezuelan armed forces supporting the country's leftist President Nicolas Maduro to let in the aid, which the opposition plans to send to the border on the same day from Colombia, Brazil and the Caribbean. "I call on the National Guard, the Army, Air Force and Navy to allow the humanitarian aid into the country. The Venezuelan people need it, even families of the military," she told reporters as she led a small anti-Maduro protest in Brasilia. Most Western counties have recognized opposition leader Juan Guaidó as Venezuela's president. His supporters planned rallies across Venezuela on Tuesday to demand that Maduro accept the international aid.